Our portable interpretation and tour guide systems offer an ideal solution for a technique known as whispered interpreting or chuchotage, in which the interpreter whispers simultaneously the rendering of the speaker’s speech into another language to listener(s) who are in close proximity without the use of a soundproof booth. The system is highly portable, very easy to use and offers a wide transmission range. Based on radio frequency technology and designed with all the necessary functions with up to 16 channels, 8 channels used simultaneously for an unlimited number of listeners. 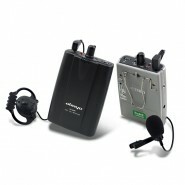 The simple system consists of a transmitter with a microphone used by the speaker and a wireless receiver with an earpiece for the listeners. Portable interpretation systems are most used during large meetings when only a small group needs interpretation. They can also be used for guided tours (museums, exhibitions, tradeshows, factories, …), small business meetings, and other one-way interpretation settings. For your high-stakes events, simultaneous interpretation and digital infrared language distribution systems are recommended. We also provide a digital infrared solution. Do you require qualified interpreters for your event? Contact us for information.